The new theatrical season is almost here! I'll start my musical autumn next week, so it's about time to take a look at the upcoming Finnish (and international) musicals. I have to admit the Finnish ones don't really make me jump with joy. in TTT's press info. So here's a logo instead. Good things first: a musical I love is returning to Finland. Out of all the upcoming premieres, I'm the most excited about Tampereen Työväen Teatteri's Evita. It'll be the first time I see a professional Finnish production of one of my all-time favourites. In TTT's season opening event on Thursday, they performed Buenos Aires. I could already spot a couple of details I loved and some choices that made me a bit wary. I'm sure the finished show will be interesting to watch. To be honest, I'm rather picky about Evita – I have many ideas about how the show should be done, and I doubt any production will ever be exactly as I imagine. But I can't wait to see how this cast and crew will interpret the musical. Helsingin kaupunginteatteri's upcoming production of How to Succeed in Business Without Really Trying (or Miten menestyä vaivatta liike-elämässä, as the confusing title goes in Finnish) looks really cute and stars the amazing Anna Victoria Eriksson. I'm curious and happy to have the chance to see this, yet not overly enthusiastic. Comedy's simply not my favourite genre of musical theatre. No matter how fun the jokes, I still tend to prefer the shows with lots of misery and death! Lahden kaupunginteatteri's upcoming Chicago also interests me. I have slightly complicated relationship with the theatre. The 2007–2008 Lahti production of Cats was my first Finnish musical love, but ever since, I've mostly felt disappointed by their musicals. But Chicago? At best, it's lots of dark fun, so I can't help hoping. Maybe the Cats magic will finally be back? Even if it isn't, though, it saddens me to know this might be the theatre's last big musical production. A must-see in any case. Beyond that... My jukebox musical quota for the year is full already, and I'm not usually very into relationship stories (ones without murder and/or supernatural elements, that is), so that pretty much wipes out the rest of southern Finland's repertoire from my list of musicals to look forward to. Sure, I'm going to see more than what I've listed here. But I'm not really counting days to the premieres. Pictured: my type of a musical. First, The Phantom of the Opera in Estonia. Non-replica productions of Phantom are few and far between, but this new one directed by Georg Malvius will be just a short boat trip away. It'll be very interesting to finally see the story of Phantom from another point of view instead of the original direction. And with new visuals by Ellen Cairns! Then, a little trip to Pforzheim, Germany. That doesn't really sound like your standard destination for a vacation, but I'm nevertheless going to see the musical Dracula there this November. I have two reasons. Firstly, ever since falling in love with Jekyll & Hyde, I've been watching a lot of Frank Wildhorn's work. 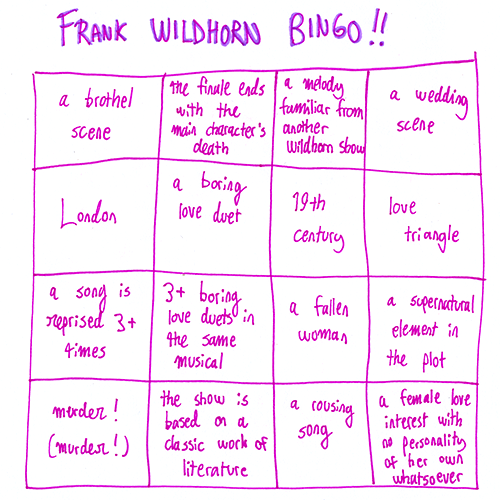 Partially, my love is ironic (see: the part about The Scarlet Pimpernel in my Bucket List post), but even if I often watch Wildhorn shows for the silly parts, I still enjoy them. So it's going to be fun seeing Dracula live. I'm taking the bingo cards with me. The bigger reason, however, is that a newfound favourite actor is starring as the lead. I first encountered Chris Murray when I watched that hilarious bootleg of The Scarlet Pimpernel, but since, he has claimed a place on my list of favourite actors. I've never been much of a bootleg person, though. There are plenty of Murray videos online, and they're great, but if all it takes to see him perform live is a weekend trip to Germany... I can't wait to see him as the Count. And finally, Chicago in Stockholms stadsteater. There's that production coming up in Finland, sure – but the Finnish one doesn't have Chris Killik cast as Mary Sunshine. I've mentioned it before that I and a friend are big fans, so I guess this is reason enough for us to do a little trip to Stockholm again. It's going to be an exciting autumn after all. Evita logo by Kari Sunnari. 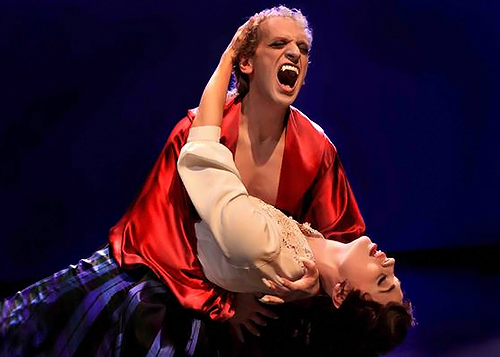 Dracula photo from Theater Pforzheim's website. Related: why I'm not that interested in Svenska Teatern's upcoming production of Mamma Mia! Kurkkaa myös: Being Alive -blogin syksyinen musikaalikatsaus, teatraalista-blogin HKT:n kaudenavajaiskuvat. Kiitos syksyn musikaalitarjonnan esittelystä! Minulla on Lahden musiikkiteatteritarjonta tuntematonta siinä mielessä, että olen nähnyt vain Suomen musiikkiteatteriensemblen juttuja siellä. Kiinnostuneena siis Lahteen. HKT:llä odotan myös Anna Victoria Erikssonin näkemistä, muuten musikaalista en osaa sanoa mitään. Evita kiinnostelee myös. Olen nähnyt HKT:n version silloin kun se tuli, mutta muistikuvat ovat hämärät. Ai niin ja kiinnostavaa Euroopan turneeta! "Menu" kuulostaa hyvältä!